In the financial sector, staying ahead of new technologies, digital transformation and customer expectations is a crucial, demanding task. We get it. With no margin for error, you need a partner with the IT, business and regulatory expertise to help you thrive in this highly competitive environment. Reach out to discuss your toughest IT challenges with experts who’ve been there. Contact us now to orchestrate a secure solution customized to your agency’s needs. Complicated regulations, strict compliance requirements and evolving cyberthreats create significant risk for banks, credit unions, capital markets and insurance firms. You need the right cybersecurity solutions to keep IT systems and information secure, safeguard customers’ personal data, adhere to regulations and control costs. Even U.S.-based financial institutions must act to meet the General Data Protection Regulation (GDPR) implemented in 2018. We’ll help you create a security and data analytics strategy that safeguards EU customer privacy, data and your IT infrastructure. Our 30 years of cybersecurity expertise and partnerships with industry leaders such as Crowdstrike and Symantec help us deliver the comprehensive assessments and next-gen endpoint solutions you need to protect your reputation. Browse our product offerings, or start with a free CDW Threat Check. How do financial institutions turn Big Data into smart data that creates business value? They use artificial intelligence (AI), machine learning and powerful analytics systems to break down data silos and innovate through digital transformation. Our experts can help you select and implement the AI technology you need to stay competitive. AI driven by high-performance computing is opening a new frontier for financial services. Combining deep thinking and machine learning with powerful supercomputing can help automate complex tasks and decision-making processes for every segment of the industry. Monitoring millions of financial transactions to discover fraudulent behavior is no easy task for financial services firms. Learn how AI technology can help your firm harness data, machine learning and supercomputing to curb fraud. Many financial institutions simply don’t have the resources to employ full-time data scientists. Fortunately, CDW offers professional and consulting services to help organizations build out analytics capabilities without costly staffing investments. We combine technology from AI leaders such as IBM, Hitachi and NVIDIA with full-scale services to get you up and running with machine learning. Optimizing channels to meet customer expectations requires a scalable IT infrastructure that can support core processing systems, existing and new technology, and state-of-the-art applications. CDW can help you choose the right IT solution to satisfy every customer on every channel. Customers are demanding more from customer support, including phone, web chat, email and mobile text capabilities. We can help you give gold-standard support with communications and productivity solutions that integrate with your existing capabilities and processes. Power up your branch to help solve customers’ more complex transactions. We can help you provide end-to-end service via bankers with mobile devices, enable seamless videoconferencing and use digital signage and custom-configured self-service kiosks to streamline the customer experience. Mergers and acquisitions (M&As) are complex processes that impact business process, people and technology. IT compatibility, infrastructure longevity and overall IT security are all crucial for success. CDW can support your organization through every phase of the M&A journey, from bigger-picture consulting to software asset management. We get that IT doesn’t just support your business — it drives it. 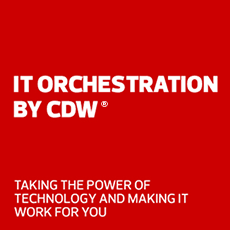 To stay competitive and drive your business forward, you need IT Orchestration by CDW™. Call to speak with a Financial Services expert.